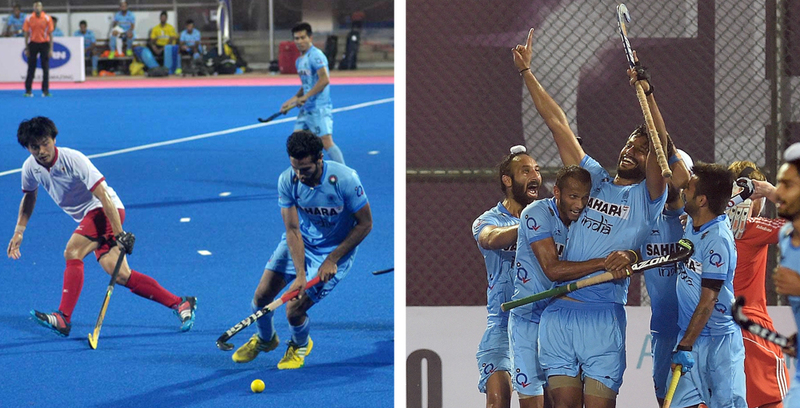 Asian Games champions India came from a goal down to clinch an unimpressive 2-1 victory over hard-working Japan on the opening day of the 25th Sultan Azlan Shah Cup hockey tournament on Wednesday. Squandering a series of scoring chances created by defence-splitting crosses that sailed across the goalmouth, India managed to earn full points against the lowly-ranked rivals through goals from young drag-flciker Harmanpreet Singh (24th minute) and captain Sardar Singh (32nd) after Kenji Kitazato (17th) gave Japan the lead. Earlier, Pakistan banked on two goals from Muhammad Arslan Qadir to open their campaign with a 3-1 victory over Canada in extremely humid conditions at the Sultan Azlan Shah Stadium. Qadir opened the account with a field goal in the 27th minute and converted a penalty corner a minute later to give Pakistan a two-goal lead. Canada then pulled one back through Richard Hildreth’s flash strike, but Muhammad Arshad capitalised on a 52nd-minute penalty corner to seal Pakistan’s victory. In their opening match later in the day, India struggled to find a leeway through the hard-working Japanese outfit, nine of whose 18-member squad at this tournament are making their international debut. After an early foray into the Japanese circle, the Indian strikers were not allowed break into the scoring zone by the rivals, who also managed to assert some pressure on the Indian defenders. SV Sunil’s deflection on a diagonal cross from Ramandeep Singh went over the cross-bar before Japan stunned the Indian defence in the 17th minute. Kitazato converted Japan’s first penalty corner by placing a fine flick to the left of Indian goalkeeper Harjot Singh. Taken aback by the reversal, the Indians began exerting some pressure and were rewarded with their first penalty corner that Harmanpreet converted through a drag-flick into the right corner in the 24th minute. Skipper Sardar then capitalised on a short diagonal pass from Jasjit Singh Kular on the right wing to beat Japanese goalkeeper Takashi Yoshikawa with a reverse shot that went into the far corner of the goal two minute into the second half. Indian strikers then had more than a couple of chances to deflect crosses into the Japanese goal, but were often caught on the wrong foot. India will next play world champions Australia on Thursday. Just after the match India’s chief coach Roelant Oltmans said he was always confident of winning the encounter against Japan even after a rusty start. “We did not have a good start today, but it is the just the beginning of a tournament,” said Oltmans, insisting that the young players he had fielded would gain a lot from playing in this tournament. “We should have scored more goals and our control was well organised,” he said. Oltmans said the Indian team must improve its ability to retain possession. “We need to improve in possession, but out performance shows that we are taking small steps forward,” he said. The coach was pleased with the penalty corner conversion by Harmanpreet Singh that equalised for India. Harmanpreet has emerged from the junior national team and this is his maiden international tournament. “It was nice to see Harmanpreet score his first goal,” said Oltmans. Oltmans said tomorrow’s league fixture against World champions Australia will be the challenge in which he wants to test his side.